The ACT Government’s Planning and Land Authority has refused a controversial development application for a six-storey mixed use residential development overlooking the Curtin shops’ central square. The Chief Planning Executive, Dorte Ekelund, said the proposed height was not consistent with the existing lower rise character of the Curtin shops. “During the assessment of this development application a number of issues were identified, largely to do with the size, character and scale of the six storey building proposal,” Ms Ekelund said. “It would … increase overshadowing onto the central courtyard which receives good solar access and is a popular meeting place and focal point for the local community. She said the planning and land authority supported redevelopment at the Curtin shops to help revitalise the area but such development needed to be in keeping with the precinct’s character and amenity. “We will work with the developer to see if an alternative proposal can be prepared,” Ms Ekelund said. The proponents, the Haridemos family, now have the opportunity to consider appropriate changes to their proposal or to approach the ACT Civil and Administrative Tribunal. 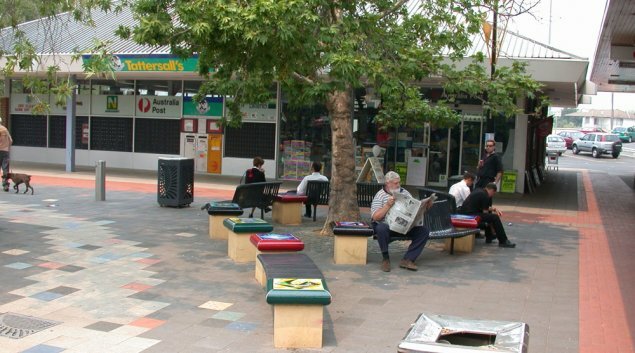 Pictured above is the square at Curtin shops. The site in question is directly opposite the newsagent pictured.